We wouldn’t like to be one of these cruise passengers who waited an hour and a half in line to get a taxi. Some people went to twitter saying they waited up to 3 hours! The extremely long wait occurred at the Canada Place cruise facility in Vancouver on Friday morning. 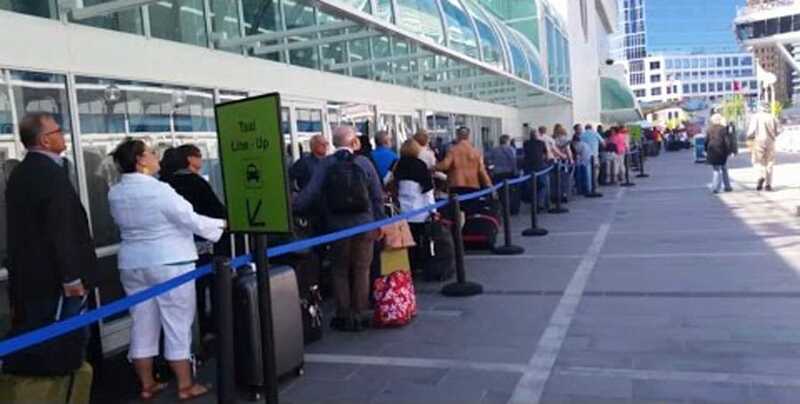 Guests who were disembarking from three different cruise ships which began arriving at the port at around 7 AM were met with a huge line outside the terminal buildings. Celebrity Solstice, Norwegian Jewel and Crown Princess had all docked at the home port on Canada’s west coast. Local news reports hundreds of passengers from all three ships were caught up in a 600 foot long taxi line so that they could begin their travels home. The line started just before 11 AM after guests had already disembarked the vessels. The line apparently stretched from Canada Place Way all the way along the piers promenade and ending up just outside Exhibition Hall A doors! 3 hour lineup for a taxi after a cruise. Toronto, Montreal, Ottawa and Calgary all have 2x more taxis per capita. Ouch. Relieved Uber is here to stay in Toronto. It’s going to be tough to travel to anywhere behind the Taxi Curtain. Looking at you, Vancouver. Thankfully guests arriving at the port for the departing voyages later in the day were not met with the lack of taxis. The City is currently struggling with a lack of taxis and no Uber operation, over 13,000 cruise ship passengers disembarking or embarking were advised to find alternative transport. Next weekend 3 ships are scheduled to dock on Saturday and another 3 on Sunday, the port will have to come up with something so the long taxi line does not happen again. Cruise Hive will monitor the situation and will keep readers updated.